Unearthing the correct disk attachment for the food processor and working fast enough to avoid the graying of potato shreds. I am almost sure the graying is why sweet potato latkes, parsnip latkes, turnip latkes, beet latkes and leek latkes rose to prominence. Because it is hard to top freshly made, golden brown, deliciously crispy potato latkes – unless we are talking a slice of smoked salmon, a dollop of sour cream and a sprig of dill. You might counter the “why not” with: Because those frozen potatoes have additives such as disodium dihydrogen (sodium acid) pyrophosphate. 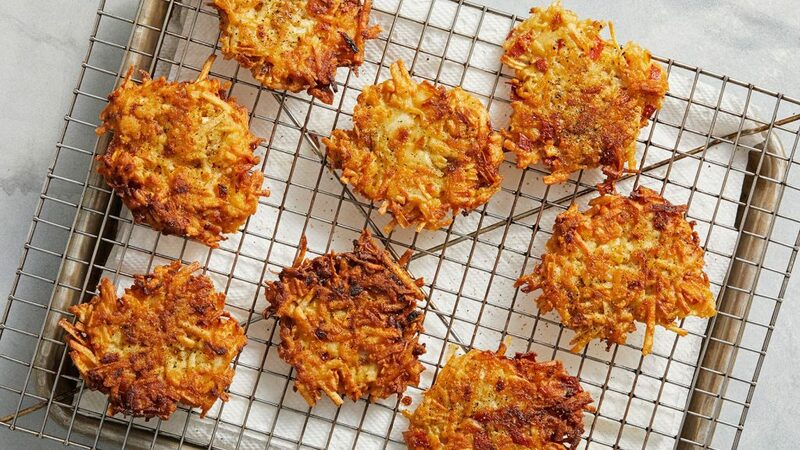 Well, as those things go, this one works in a latke-maker’s favor. The chemical helps keep the raw potato from discoloring, and the scientific community’s verdict indicates this type of additive is acceptable in small amounts, on occasion. Although the package may indicate “keep frozen,” I’m here to say that if you do go with the “why not” approach, refrigerate the appropriate amount of frozen shredded hash brown potatoes in a towel-lined bowl overnight. This will wick away moisture – and there will be more moisture to wring out. Even so, I find these potatoes become drier, and therefore better for latke-making, than the hand-shredded/wrung out ones I typically do. The best part of the accompanying recipe might not even be the use of pre-shredded spuds, but rather the onion component. A worthy latke contains onion in some form; it’s not worth arguing in the comments field or via email. I will simply not engage. Rather than mincing and grating and crying lots of oniony tears, I have chosen to caramelize a pot’s worth. This takes about an hour, including the slicing (okay, a few tears there) and you’ll have plenty left over to grace a sandwich or omelet or what have you. Caramelized onion will bind the potato mixture and infuse it with oniony goodness, not to mention nice color.